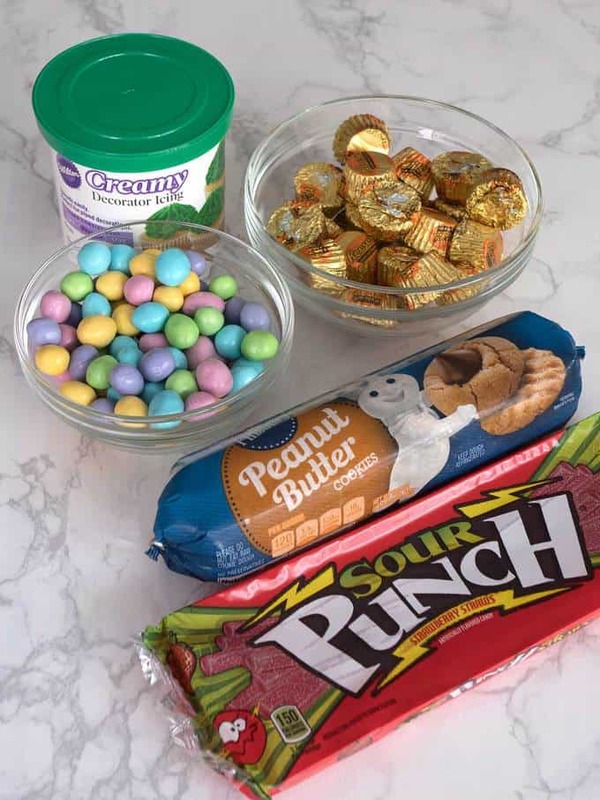 I used the following ready-made ingredients: Refrigerated peanut butter cookie dough, Reeses peanut butter cups miniatures, green creamy decorator icing, sour punch straws, and pastel M&M’s. I started by spraying my mini muffin pan with non-stick vegetable spray. I knew that the cookie dough weighed 16 ounces, and that I wanted to divide it into 24 pieces. Being the cooking nerd that I am, I did the math and determined that each piece of dough needed to weigh .67 ounces. Therefore, I pulled out my trusty kitchen scale and weighed each piece of dough. I told you that I was a cooking nerd! I rolled each piece of dough into a ball, and dropped it onto the well of the mini muffin pan. Then, I pressed each ball down into the well. I popped the mini muffin pan into a 350° F preheated oven for about 12 minutes. While the cookie cups were baking, I unwrapped 24 miniature peanut butter cups. I removed the muffin pan from the oven, and immediately pressed a Reese’s Peanut Butter Cup into the center of each of the cookies to form the cups. I let the cookie cups cool completely before I removed them from the pan to a wire cooling rack. I filled a piping bag fitted with a #233 tip, with some of the decorator icing, and piped “grass” in the center of each cookie cup. Then, I made the basket handle with a piece of sour punch straws that I had cut in half. I finished the basket off by placing two M&M’s in the “grass”. Initially, I was going to use the M&M peanuts, but they turned out to be too big. 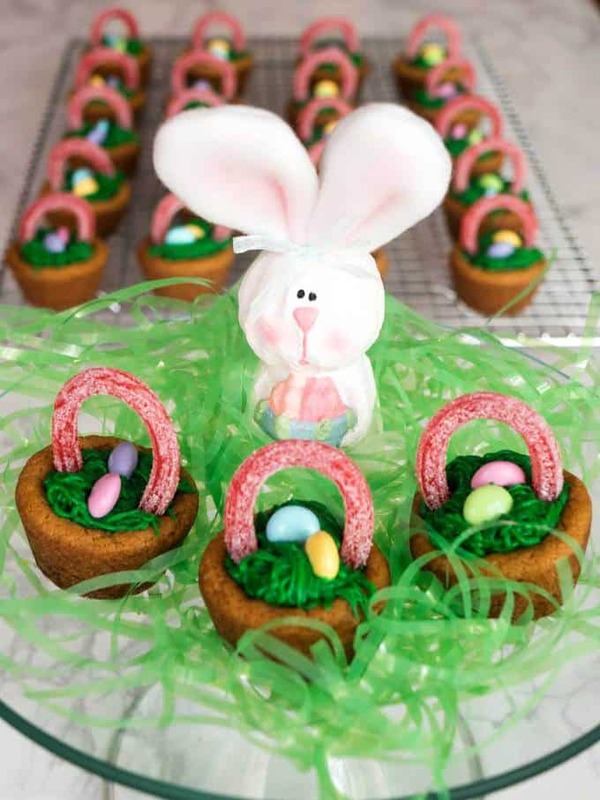 I ended up with 24 absolutely adorable and delicious Easy Easter Basket Cookie Cups. Yum! This recipe is reposted from March 25, 2017. If you liked the recipe above, please consider rating it and leaving a comment below. Also be the first to receive notifications of new posts by email, enter your email address in the Subscribe box. Thank you so much for visiting the Pudge Factor! 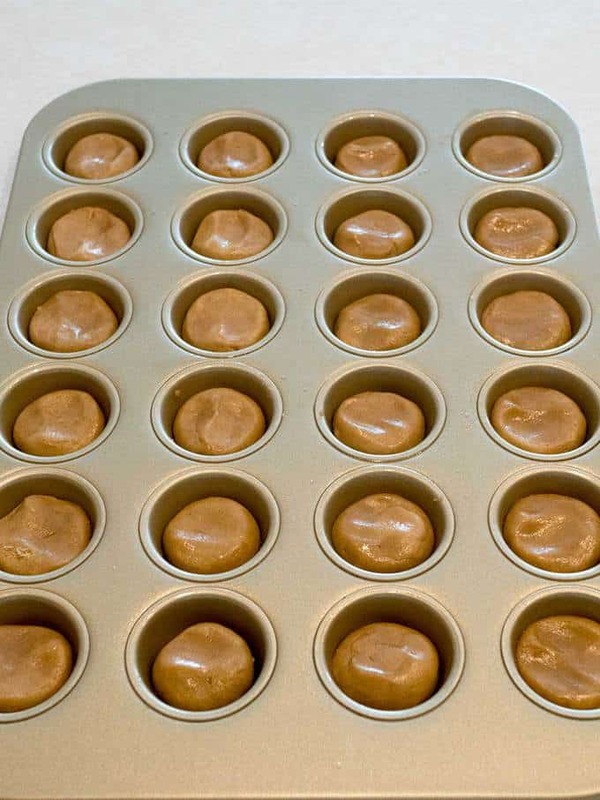 Preheat oven to 350° F. Spray 24 cup mini muffin pan with nonstick vegetable spray. Unwrap cookie dough and cut into 24 equal sized pieces (.67 ounces each). Roll each piece into a ball and drop into well of mini muffin pan. Flatten dough. Bake at 350° F for 10 to 12 minutes, or until golden brown. 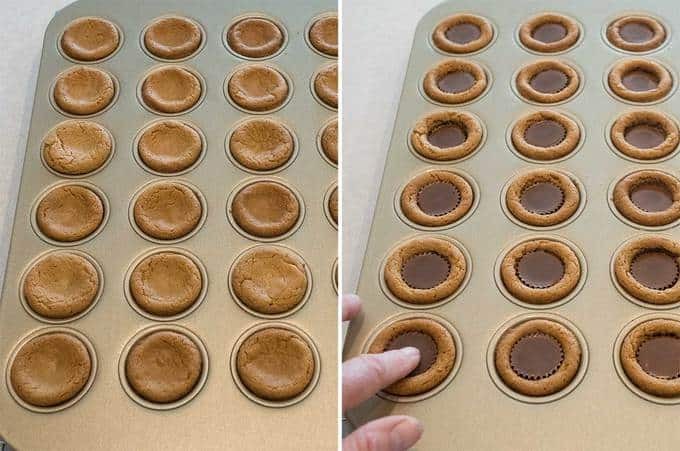 Remove from oven, and immediately press a Reeses miniature into the center of each cookie to form a cup. Allow to cool completely. Remove from mini muffin pan to a wire cooling rack. Fill pastry bag fitted with #233 tip with decorator icing. Pipe "grass" onto top of peanut butter cup. Press basket handle into cup. Finish by pressing two M&M's into the "grass". 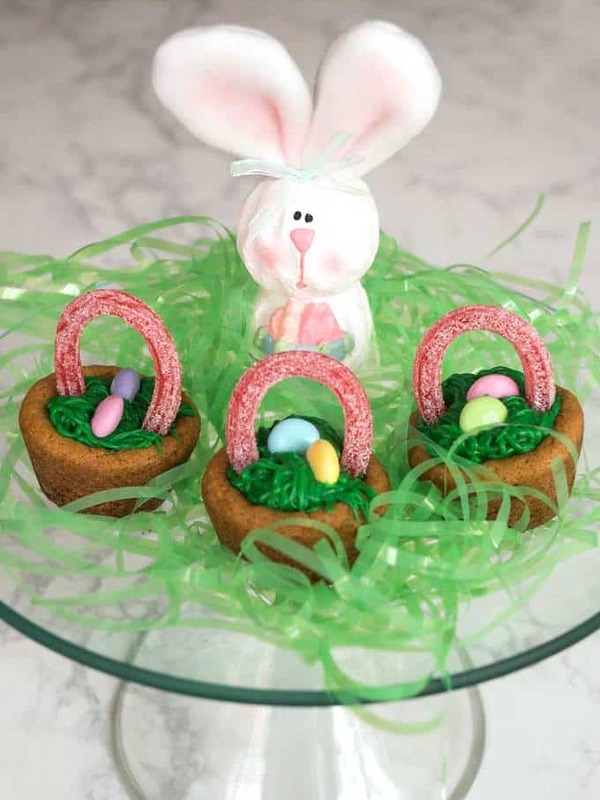 Yield: 24 Easy Easter Basket Cookie Cups. These are adorable - my kiddo would love them! These are completely adorable and easy enough to kids to help. Great idea. Kids would have a blast making/helping with these! 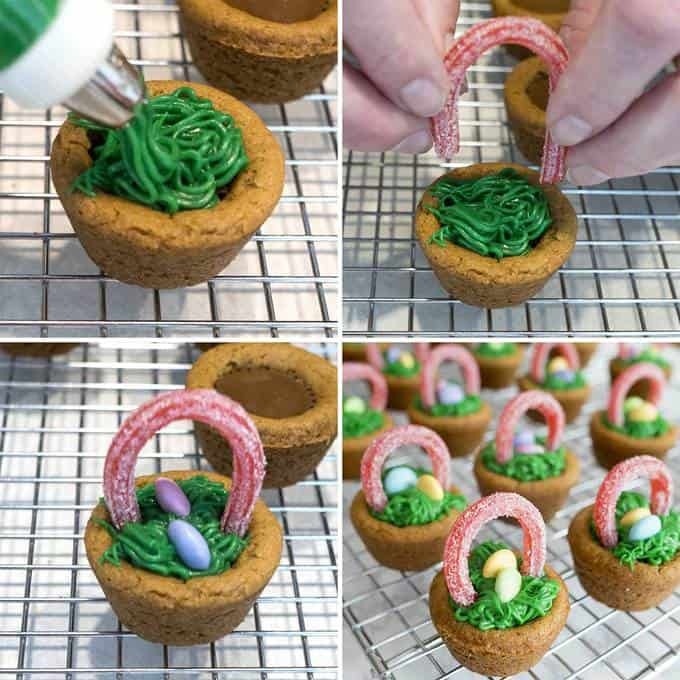 Super cute Easter idea! Thanks for sharing!